A tropical wedding creates visions of palm trees, warm sandy beaches and romantic moonlit nights. All weddings take a lot of time and work, however this type of wedding adds a special dimension to your big day. From picking the location to where to spend your honeymoon there are a lot of little details to consider. If you are having a destination wedding it becomes even more challenging to organize your wedding. To help with your planning below are seven steps to having a perfect wedding with a tropical twist. Your first step should be choosing the location. This is where it all begins, and without it your wedding just wouldn't be tropical. If you already live on a tropical island or know where you want to get married, you can skip to the next step. For the rest of us we need to find a location that meets our budget and vision. This is just the start. There are many other islands and locations that would work great for this type of wedding. Visit our Beach Wedding Ideas page for more information on the questions to ask when planning a wedding on the beach. Beach Wedding Ideas - Tips and ideas for planning the perfect wedding on the beach. Nautical Wedding Ideas - Tropical doesn't have to mean beach. 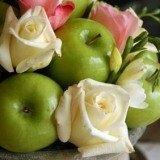 Flower Theme Ideas - Pick your favorite tropical flower as your theme. Color Theme Ideas - Tropical colors like red and light blue make great theme ideas. Another idea would be to take something unique to the island or location where you are getting married and turn it into a theme. Attire is typically more casual than traditional weddings. A Tropical wedding dress is lightweight and simple yet elegant. While white for a wedding dress is traditional, your wedding dress can include flowers. If you are using a tropical flower wedding theme, try to include it in your wedding dress or your bridesmaid’s dresses. Footwear for the bride includes sandals, thongs or none if you want to truly get married with your feet in the sand. Attire for the groom and groomsmen typically consists of linen pants and a white shirt. If you want to add some color a Hawaiian or floral shirt works well. Sandals make the best choice for the men or no shoes if the bride is barefoot as well. Visit Tropical Wedding Dress and Beach Wedding Shoes for more tips. 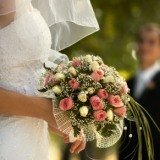 As with any wedding you will probably use flowers as decorations and in the bridal and bridesmaid bouquets. If you are having a destination wedding at an island resort your choices may be limited. Call the resort or your wedding planner to find out what flowers are available at your wedding location. Depending on the location and season certain flowers might not be available. Visit our Tropical Flowers guide for more ideas. If you are having your wedding on a tropical island take advantage of local forms of music and entertainment. For example, in Hawaii consider having fire and hula dancers and local, traditional music. In Mexico or the Caribbean a Mariachi trio or steel drum band is a fun idea. Sending your guests home with a wedding favor is a great way for them to remember your tropical wedding. While they aren't required, it is a nice gesture especially if your guests traveled a long distance to attend your wedding. There are many choices for wedding favors, and our guide on beach wedding favors should be a big help. This is where the fun begins, and it is the perfect ending to your big day. If you are getting married at a resort find out what honeymoon packages are available. You are almost certain to get a special offer and treatment in one of their honeymoon suites. Some couples who have destination weddings choose to have their honeymoon at a different hotel from where they had their wedding ceremony. If children will be present at your wedding you may want to move to an adults-only resort for your honeymoon. They are usually quieter and designed to cater to newlywed couples. Visit Best Honeymoon Destination to get more ideas and information. Why not make your own invitations. Here are a couple of ideas to make your own Tropical Wedding Invitations. Hand made invitations add a unique and more personal touch to your wedding. They can also save you money which is always a good thing right!